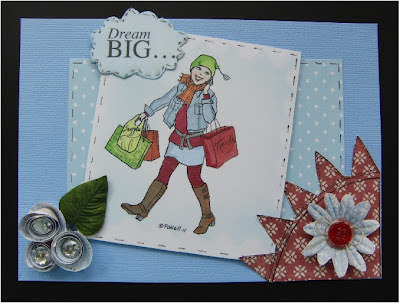 Oh my word this card is done at last ,my mojo has gone walkabout and i thought i wouldnt be able to come up with a card for this weeks challenge over at Phindys place challenge blog..ps if you see my mojo can you send it back please lol. Haven't seen your mojo - you may just still have it. Great colouring of this image. By the looks of this great card your mojo is just fine. Hi Fairy this looks super and I can't see any missing mojo! Thank you for joining us for this week’s Phindy’s Place Challenge, do hope you’ll play again this Friday! So sweet! Doesn't look like a case of missing mojo here! Beautiful color combo and the rolled flowers are wonderful. Thanks so much for joining the challenge at Phindy's Place this week.